"Fizz Ed" was the first episode of the fifth and last season of Daria. It first aired on MTV on February 19, 2001. "Fizz Ed" was written by Glenn Eichler. Following voters rejecting an increase in property taxes (again), Lawndale High is going through a budget crisis and the students are lacking basic educational material like post-USSR maps, paint and good photocopy equipment. Despite the teacher's protests, Ms. Li only decides to act when she notes there is a lack of football equipment. She is visited by Leonard Lamm, who brings a plan to create extra revenue for the school: by increasing the number of soda vending machines and installing publicity in school grounds, the school could negotiate an exclusive contract from a soda company, including monetary donations. Ms Li is enthusiastic and, to make sure the plan passes, makes only a discreet notice for its discussion to take place in an assembly on Super Bowl Sunday, expecting nobody to appear. Daria is suspicious of the date and tries to get her parents involved and attend the discussion. Helen and Jake, however, have other plans for the day and suggest for her to get involved instead. Daria and Jane end up attending, being the only public present besides Lamm and Li. 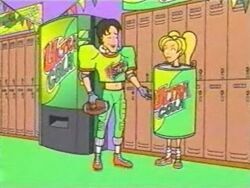 Daria objects to the school's endorsement of the soda and the presence of advertising, but her objections are ignored or overruled. In a few days, the effects of the contract are visible, with more vending machines and posters advertising Ultra Cola in the school hallways. Daria does not give up and takes her complaints to Jodie. But Jodie, although uncomfortable with the ads, also appreciates the monetary benefits and suggests that Daria herself do something, pointing out that she is always complaining. Daria brings up this last comment when talking with Tom, who states there is nothing wrong in complaining, as long as one is actually doing something. In the end, Daria goes to see the county school superintendent, Mr. Cartwright, describing the situation in Lawndale High. He is skeptical, reveling he had been considering doing a similar soda contract to all county schools and further asking whether Daria's complaint isn't just to earn herself a school extra credit. Daria denies it, stating her reasons are that her colleagues and the school don't deserve what Li is doing, and insisting the superintendent comes to see for himself. Despite her pleas, all she gets is a promise that he'll eventually visit the school. Meanwhile, Lamm notes to Li that the school isn't meeting the Ultra Cola consumption quota to justify the endorsement money. This leads a increasingly paranoiac Li making every effort to bring students to consume the drink: the school halls and bus get the Ultra Cola logos displayed; the football and cheerleading teams get new uniforms; teaching materials now constantly make references to the soda. When this isn't enough, Li bribes the football players with higher grades for all who drink soda and even tries to have the elementary school kids drink it. Finally, mentally breaking down, she roams the school with an axe, smashing open the vending machines in order to get the students to drink Ultra Cola, only to be shortly after carted off in an ambulance. This psychotic scene is witnessed by the superintendent, who had made an unannounced visit. In the end, the situation has almost returned to normal: the soda machines have been banned from the hallways, but still exist in the cafeteria; ads for Ultra Cola have been paired down to school event tickets and the Lowdown, and Li has returned as principal despite her psychotic break. Daria is hesitant to declare victory, however, as the roof of Lawndale High has been painted with the Ultra Cola logo, ensuring that all who pass over Lawndale by plane are marketed to. The Super Bowl is generally held in January or February. However, the following episode takes place in November. Just to confuse matters further, a tax referendum in the US would generally be held in November general elections: did the first two minutes of this episode take place over a two month period?? In a surprisingly handy bit of chronology, the Super Bowl is on the 30th in this episode - it was held on the 30th in 2000. Some Daria fanfics have Daria graduating in 2000, allowing for this and the dotcom satire of Buzzdome.com. Lawndale is in a state where the governor had to hold a public referendum before he can raise the taxes. Glenn Eicher, writer of this very episode, has said in interviews that he viewed Lawndale as being in a Mid-Atlantic state, possibly Maryland (and the state governor shown does resemble Maryland's Governor Glendening); however, none of those states vote on whether their taxes go up. California voters do this though, and in 2000 (when this episode was written) there were two school-related tax propositions that were voted down. Li boasts about being "fourth runner-up for Principal of the Year by the tri-county chapter of the Asian-American Women in Education's Caucus" (which she got by forcing students to phonme up the Caucus). Fan reaction to "Fizz Ed" was divided. The episode was similar to a prominent fanfic, which led its author to announce on Outpost Daria that he would be suing the Daria creative team. He later announced this was a hoax. Other fans felt the episode was an inferior copy of the first season episode This Year's Model. In particular, Daria's realistic reaction in "Fizz Ed" to circumstances similar to those in "This Year's Model" was a point of contention. It is worth noting that this is the first "normal" episode after a string of pivotal Daria/Tom centric episodes: Fire!, Dye! Dye! My Darling, and Is It Fall Yet? so fans at the time of first airing who had been expecting to see more development of that story thread may have felt let down. An AU version of this episode is story Fizzy Logic, of the John Lane series by Richard Lobinske. Second March 2005 interview with Glenn Eichler on DVDaria, which includes a long response about the strengths and drawbacks of "Fizz Ed" as an episode. This page was last edited on 3 April 2019, at 01:44.